Advance PSS has been fortunate in being funded by the Big Lottery Awards For All programme to provide a project that aims to help people in Liverpool make their social care and health services more personal. We were excited to announce the launch of our LEEP project. Our free launch event took place on 25th April 2014. Our project is rooted in the ideas and values of 'personalisation'. Advance PSS believes that the best way for people to create services that provide them with maximum benefits is for people to take control of their own services. There are lots of examples up and down the country where disabled peoples lives have been transformed through using personal budgets and direct payments. Our LEEP project adds to the great things that are happening in Liverpool to make personalised support a reality. Our project has three interconnected stages. 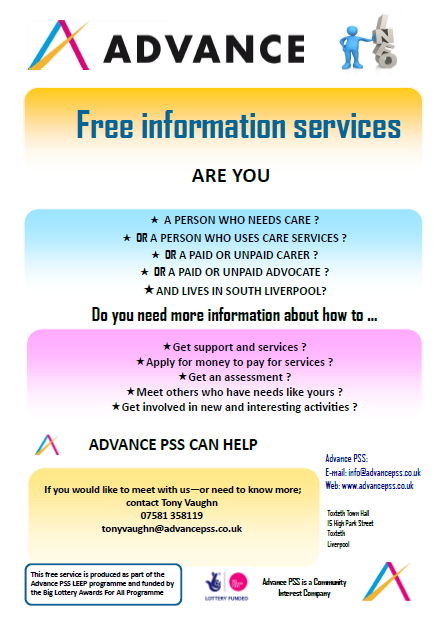 Firstly we are providing information about personal budgets and direct payments to people in the South areas of Liverpool. Secondly we are helping some people who want to develop their support plans by working with them directly. The final part of our project will develop a programme based in Toxteth Town Hall when we will offer arts and drama to a group of people to help develop leadership skills to help make key decisions about their lives and their futures. To find out more about our project download the programme brochure by clicking on the file below. Or even better, if you need any information or assistance about personal budgets or direct payments why not drop in and see us at our office at the fabulous Toxteth Town Hall. The kettles always on and you will always get a warm welcome. To contact us or find out our address see our 'info' page. The Care Act 2014 supports a huge shake up of social care in England and replaces much of the legislative framework for Councils and statutory bodies from April 2015. The Act signals a new age of social care for people who require services. Providers of social care bracing themselves for the impacts of the reforms and repeals. Many are struggling to keep pace with what the legislative changes mean to them in the face of on-going resource and commissioning issues. Revised regulation and inspection arrangements, duties of candour and impacts of the Act on human rights status all present serious challenges to providers that require a higher level understanding of the new legal architecture. Likewise new duties and statutory processes surrounding adult safeguarding make it imperative that organisations stay up to date on local adult safeguarding arrangements, including revising their own policies and procedures where necessary. But this will be best achieved through accurate interpretation of the Act, its regulations and statutory guidance. But it’s not all gloom and doom for providers. Whilst there are clear risks, the new legal framework also presents significant opportunities for organisations that have developed a grasp of the new legal framework. The Act, together with its regulations and statutory guidance changes the way that providers trade with local authorities. And this means that providers need good up to date and accurate legal information in order that they can move forward with confidence in terms of their relationships with their customers and also with their commissioning authorities. The Act sets the scene for ambitious councils to market shape in new and innovative ways that will hugely impact upon their commissioning and contracting relationships with providers. Providers need to be prepared for this new world of commissioning. For providers to engage in the new markets they require a honed understanding of how the duties arising out of the Act changes assessment processes, eligibility entitlements and care and support planning. Likewise mastering how the provision of information and advice together with independent advocacy could act as a trigger for organisations to reposition their business thinking. The really good news is that It’s not too late ! 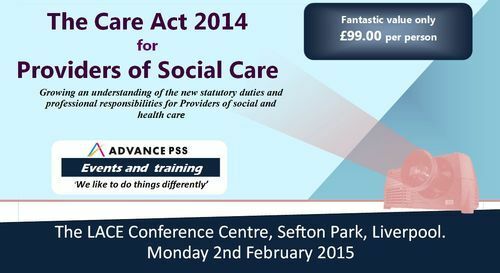 Where better to start than on 2nd February 2014 listening to some of the leading thinkers and commentators about the Care Act 2014 in the Advance PSS event the Care Act 2014 for Providers of Social Care ? Speakers at the event are from the leading social care consultancy and training organisation Care and Health Law including Belinda Schwehr, legal author, academic and independent commentator who will deliver the key note speech. Other presenters include Sue Inker, legal and professional practice trainer and legal consultant; Nick Marcangelo, experienced social work manager and independent health and social care consultant; Antony Thorn: experienced strategic commissioner, social care manager, bid writer and director of social enterprises. The impact of Human Rights status for most regulated providers. As part of our LEEP programme we have just spent a morning in the company of the good folk of Mary Seacole House chatting all things personal budgets and direct payments. Thank you for being so welcoming and also for the great contributions. We were contacted today by a person that we met in ASDA on Friday while we were chatting with people about direct payments and personal budgets as part of our LEEP project. The person said that before speaking with us they had never heard about direct payments. On Saturday she was badly let down by their home care service who just didn’t turn up ! So she decided to take things into her own hands and ask the Council for a direct payment. She said The Council were good when she contacted them and are sending someone round to talk with her about how she can get direct payments. She was really happy because this means that she can now decide for herself who can support her and this puts her in control - and that’s what personal budgets and direct payments are all about. People commissioning their own services. On Friday we popped up a pop up stall in ASDA Smithdown Rd to talk with people about using personal budgets and direct payments - what a fab day ! Amazing how many people want to know more. Thanks ASDA for being so welcoming - we’ll be back soon. Welcome to our all new blog page. We will be blogging here regularly about lots of different topics. Check in with us regularly to see what we have been up to. To attend our LEEP programme free launch event on 25th April 2014 (lunch provided) - download the flyer on the right.